If Italian cuisine is your thing, you must try the thin-crust pizzas from Basilia, a quaint new pizzeria in Aundh, near Medipoint Hospital. 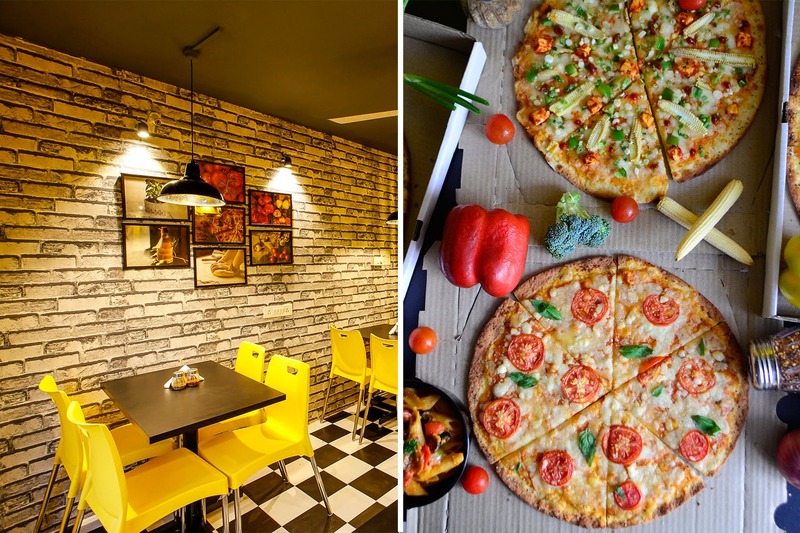 Basilia Delicatessen in Aundh is a charming little pizzeria with the cutest and the brightest decor ever – yolk-yellow walls, chessboard flooring, hanging lights, a live kitchen, bricked walls with amazing food photographs and comfortable homely vibes. The menu, on the other hand, is simple and authentically Italian. Think thin-crust pizzas and creamy cheesy pastas, and you’ve got it all covered at Basilia. We hear their Hawai pizza with sliced juicy pineapple, fiery jalapenos and caramelized onions is a must-try along with a side of crispy nachos smothered in tangy salsa sauce. Another pizza that we absolutely loved was the sun-kissed Margarita topped with sun-dried tomatoes, olives, basil and ricotta, dressed in olive oil. What’s more? You can also make your own pizza; choose your own toppings, garnish, protein and dressings. All the pastas at Basilia are available only in penne. There are not many options though, but the creme de shroom (mushroom pasta in white sauce) is definitely worth a try. Ditch the bigger brands, try authentic thin-crust pizzas from this homegrown eatery.